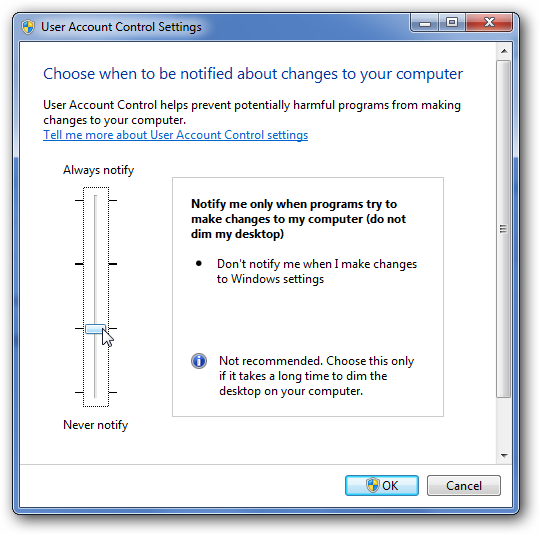 The User Account Control (UAC) is a new security policy of Windows vista and 7, which is not exist in windows XP. UAC is designed in order to enhance the security of OS. However, it usually block most operations on the drive C.
If you installed Hotel Lock System software on the drive C, you'd better disable the UAC otherwise the database of Hotel Lock System software can not storage correctly. 1. Open the control panel and find the menu Change User Account Control settings. 2. Drag the slider up or down, depending on how often you want to be alerted. It recommend to the 2nd level or the last one. 3. Click OK and restart your OS.